This is the 3rd addition to Dominion. It adds 12 new Kingdom cards to Dominion, plus a new resource: Potions. 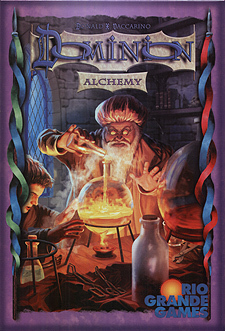 Dominion: Alchemy is an expansion, and can't be played by itself; to play with it, you need Dominion, or a standalone expansion to Dominion (Dominion: Ingrigue). Those provide the Basic cards you need to play (Treasure, Victory, and Curse cards), as well as the full rules for setup and gameplay. Dominion: Alchemy can also be combined with any other Dominion expansions you have.